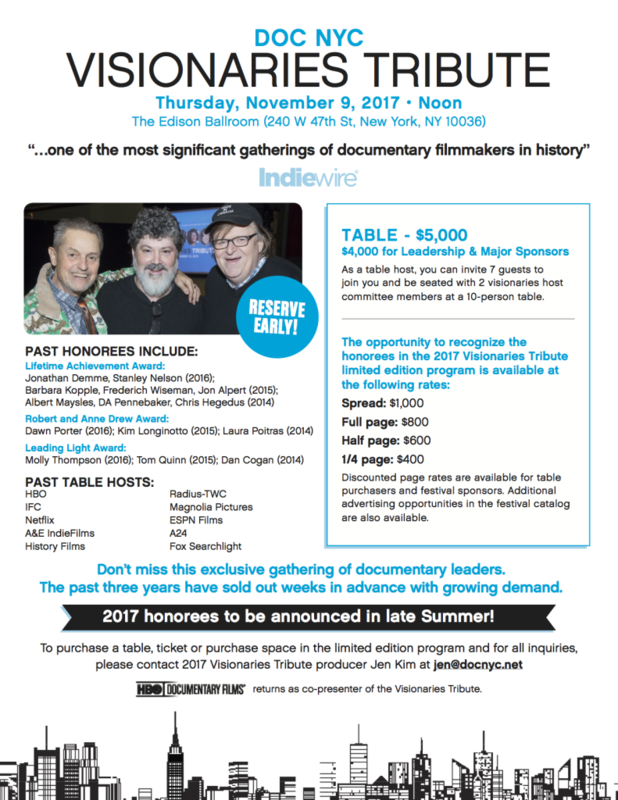 The fourth annual Visionaries Tribute lunch will take place at the Edison Ballroom on Nov. 9, 2017. – Errol Morris has been a continuous innovator in the documentary form with films such as Gates of Heaven; Vernon, Florida; The Thin Blue Line; Fast, Cheap & Out of Control; Mr. Death; the Oscar-winning The Fog of War; and Standard Operating Procedure. His film Tabloid was the Closing Night Film of DOC NYC’s first year in 2010; and The Unknown Known was the Opening Night film of the 2013 festival. His latest film is The B-Side, while his highly anticipated Netflix series, Wormwood, will debut later this year. – Sheila Nevins is President of HBO Documentary Films and has overseen documentaries for the channel for over 30 years. She has supervised the production of over 1,000 documentary programs for HBO. As an executive producer or producer, she has received 32 Primetime Emmy Awards, 34 News and Documentary Emmys, and 42 George Foster Peabody Awards. During her tenure, HBO’s documentaries have gone on to win 26 Academy Awards. She is the author of the New York Times bestselling book You Don’t Look Your Age… and Other Fairy Tales. Past Lifetime Achievement recipients are Jon Alpert, Jonathan Demme, Chris Hegedus, Barbara Kopple, Albert Maysles, D.A. Pennebaker, Stanley Nelson, and Frederick Wiseman. The honorees are selected by the festival programming team, based on recommendations from the Visionaries Host Committee. The Robert and Anne Drew Award for Documentary Excellence goes to a mid-career filmmaker distinguished for observational cinema. This year’s recipients are the filmmaking partners Heidi Ewing and Rachel Grady, who will receive a $5,000 cash prize sponsored by Drew Associates. Ewing and Grady’s latest film One of Us, about three Hasidic Jews who are seeking to move out of their insular community, screens at DOC NYC as part of this year’s Short List. Their previous films include Norman Lear: Just Another Version of You, Detropia, 12th& Delaware, Jesus Camp and The Boys of Baraka. The award’s name celebrates Robert Drew, who pioneered the documentary style that came to be known as American cinema vérité, and his wife Anne, who was his filmmaking partner for more than four decades. The three previous recipients were Dawn Porter, Kim Longinotto and Laura Poitras. The Leading Light Award for a mid-career professional who serves documentary outside of being a filmmaker that will be given to Cara Mertes, director of the JustFilms initiative at The Ford Foundation. JustFilms works globally to support artist-led films and new media projects, strengthen organizations and networks for artist-driven content and develop new leadership and resources in this field. Prior to leading JustFilms, Mertes served for eight years as director of the Sundance Institute Documentary Film Program; and another eight years as the executive director of the PBS documentary series POV. The 2017 Visionaries Host Committee includes Amir Bar-Lev, Joslyn Barnes, Geof Bartz, Amy Berg, Joe Berlinger, Rachel Boynton, Nancy Buirski, Rebecca Cammisa, Maro Chermayeff, Christine Choy, Marshall Curry, Kate Davis, Carl Deal, Deborah Dickson, Nicholas Doob, Ezra Edelman, Bob Eisenhardt, Lewis Erskine, Susan Froemke, Geeta Gandbhir, Liz Garbus, Alex Gibney, Julie Goldman, Thomas Allen Harris, Chris Hegedus, Judith Helfand, Amy Hobby, Kristi Jacobson, Ross Kauffman, Barbara Kopple, Tia Lessin, Marc Levin, Marilyn Ness, D.A. Pennebaker, Frazer Pennebaker, Laura Poitras, Bob Richman, Robert Richter, Richard Rowley, Deborah Shaffer, Enat Sidi, Morgan Spurlock, Jonathan Stack, Ricki Stern, Robert Stone, Annie Sundberg, Chai Vasarhelyi, and Pamela Yates. Tickets for the Visionaries Tribute lunch are available for $625 per seat or $5000 per table. To buy individual tickets, click here. For more information, contact Event Producer Jen Kim at jen@docnyc.net.